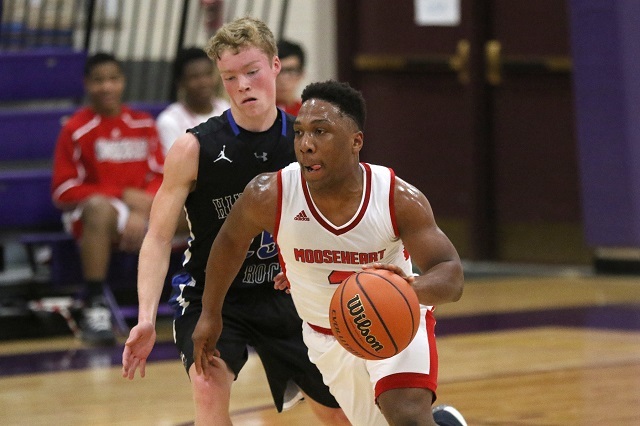 Mooseheart’s boys basketball team took a confident first step into the Class 1A tournament on Tuesday with a 59-27 victory over Hinckley-Big Rock in the opening round of the Serena Regional. With the victory, the Ramblers (14-6) advance to meet Westminster Christian in Wednesday’s semifinals. Game time in Serena is 7:30 p.m. The Ramblers (14-6) took an early lead, which reached 18-5 after the first quarter. Fourteen of those points were scored by Mooseheart’s Na’Shawn Howze, who finished the game with a game-high 27 points. Like most of Mooseheart’s starters, Howze did not play much in the closing stages of the contest. While Mooseheart’s offense cooled a bit in the second quarter, the Ramblers still carried a 32-10 lead into the locker room thanks to a solid defensive effort. None of Hinckley-Big Rock’s players scored more than 3 points in the first half. “What I was really happy with was that we talked about having a defensive strategy and the guys really carried it through They played with intensity and stayed disciplined on defense,” Mooseheart boys basketball coach Pete Daneels said. While Hinckley-Big Rock made several attempts at a comeback, none gained traction. Howze added 11 points in the third quarter and the Ramblers pushed the lead to 47-17. The fourth quarter saw a number of bench players from both teams see playing time. “At halftime, I told them that we had a 22-point lead and the only way they were going to get back into the game was by a lack of defense intensity on our part. I told them that even if we didn’t make a shot, they shouldn’t be able to come back against us if we play good defense, and they did that,” Daneels said. Through the game, Mooseheart’s superior team quickness showed itself time and again as the Ramblers tracked down loose balls, grabbed rebounds and stretched the Royals on both ends of the court with their movement. “That’s who we are and what we have to rely on. You look at a guy like Nelson Doe, who will go after every loose ball or crash the boards every time. We have a number of guys just like that,” Daneels said. Howze was the only player on either team to reach double-digit scoring. Mike Lowe added 9 points for the Ramblers. Hinckley-Big Rock was led in scoring by Spencer Brown’s 6-point effort.